AccessibilityOnline represents a collaborative training program between the ADA National Network and the US Access Board. The AccessibilityOnline Webinar Series is free and offers real-time captioning in all sessions. Sessions are held on a monthly basis and cover a variety of topics concerning accessibility to the built environment, information and communication technologies, and transportation. The training is being coordinated and hosted by the Great Lakes ADA Center on behalf of the ADA National Network as a mechanism to provide accurate and quality training on the Architectural Barriers Act and Americans with Disabilities Act (ADA/ABA) Accessibility Guidelines and on electronic and information technology accessibility standards (Section 508). 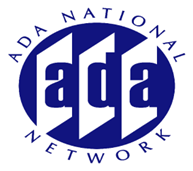 The ADA National Network provides a comprehensive set of services for up-to-date information, consultation, referrals, resources, and training on the Americans with Disabilities Act for businesses, employers, governmental entities, service providers and individuals with disabilities.